Colette loves to co-create magic and miracles with her clients. She is a certified Access Consciousness Bars Practitioner and has been changing lives with it for the last year. She is also a life coach with a focus on dating, relationships, business, and goal setting. She works with people of all ages to create the life you desire but didn't think was possible. Kate is an Empowerment Coach & Holistic Healer. She offers services to support healing & renewing your relationship to love; self-love, dating, & having loving relationships in your life. She also assists with cultivating your inner empowerment & mindset, higher levels of wellbeing, & powerful breakthroughs with anything weighing you down or holding you back in your life. 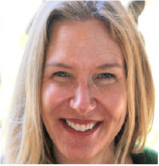 Jennifer McCarthy specializes in a holistic approach to psychotherapy. She works with individuals, couples, families, and groups with a focus on how small changes can make a big difference toward better health.